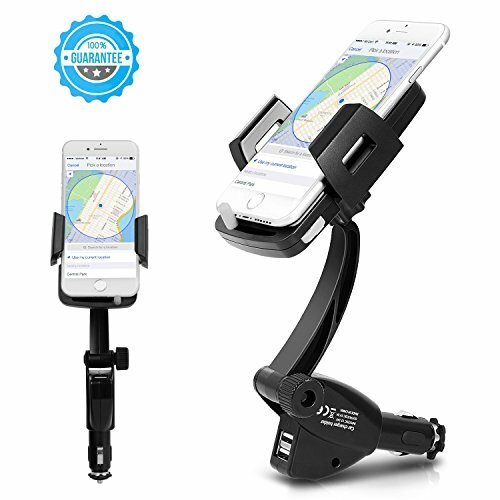 ♪ 3-in-1 Design: Phone car mount holder, dual USB phone charger and cigarette lighter are integrated into one, a perfect solution for smartphone mounting and charging. ♪ Dual USB Charging Ports: Dual 3.1A USB charging ports allow you to charge two devices simultaneously (Max output 5V 3.1A). Cigarette lighter connector designed with insurance to intelligently protect your device from over-current, over-voltage and short circuit. 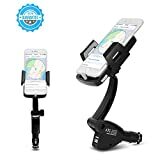 ♪ Adjustable Gooseneck: The goose neck is highly customizable and flexible to turn 360 degrees, allows you to place your phone or GPS horizontally and vertically, ensures optimal viewing angles and safe driving.